The kingdom hangs in the balance. War threatens Foxwick on all sides. The dreaded Shadowlands gains more souls. From the shrouded trees in Greymist Forest to the arid Blackden Barrens, monsters roam in search of their next victim. Sirens lure ships beneath Merrilea Sea. In cold and snowy Wintermill, royals plot to claim Foxwick as their own, even if they must use dragons and sorcery. Marriage between Foxwick’s king and Lochhollow’s princess creates a perilous alliance. Although brave Valdale will come to Foxwick’s aid, the cost may be more than a true friend can stomach. 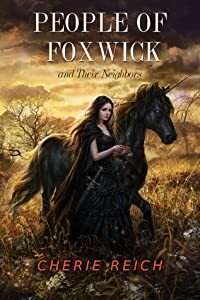 Set over a hundred years, these seventeen fantasy short stories explore the people, creatures, and lands in and around the Kingdom of Foxwick. Short stories in the collection: Common Love, Blind Scribe, Lady Bard, Siren’s Call, Tribal Abandonment, Dragon's Sacrifice, Dragon Spy, Dragon Seer, Sword Master, Lady Death, Mage Game, Courting Magic, Monster Hunger, Mourner’s Lament, Magic Seeker, Prince’s Price, and Love’s Challenge.